Lucky star malayalam movie songs Parayu Njanoru Sundariyalle, Anjithal Poo Pookkum, Kungu Vava are getting positive response from viewers after the videos hit You Tube a week ago. The man with magical chords, Ratheesh Vega is back with enchanting tunes is set to freeze the minds after 'Attumanal Payayil'in Run Babby Run. The year 2012 proved to be lucky for young musician Ratheesh Vega who gave hopes for music lovers by striking the magical chords. Cocktail and Beautiful sowed the seeds for Ratheesh, which proved to be the stepping stone for his successful journey with music. 'Attunmanal Payayil' was a real break for Ratheesh which has now landed in 'Lucky Star'. The movie directed by Deepu Anthikad starring Jayaram, Rachana Narayankutty and Pooja Ramachandran in lead has got some more reasons to get hooked. The alluring teasers of the video songs Parayu Njanoru Sundariyalle, Anjithal Poo Pookkum, Kungu Vava has already reached the masses. 'Isthiri Cut, an item number featuring American actress Linda Arsenio has already gone viral with its majestic tunes and enchanting camera shots. Linda Arsenio is not new to malayalam movie lovers after she has predominantly appeared in Pazhassi Raja as Doora baber, the fiancée of assistant collector Baber and as a TV journalist in Dam 999. She had made her presence in Sachein, Thotti Jaya, Kedi, Bhadra, Kana Kandaen, Kabul Express, Mumbai Salsa, Allo Chhat etc. 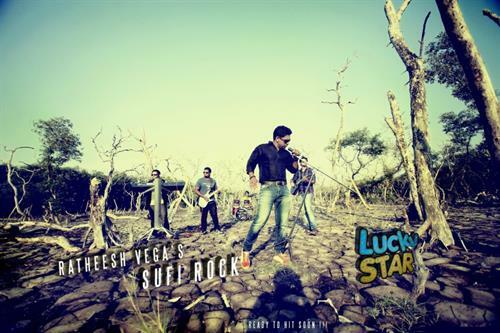 The songs of 'Lucky Star' do have all the power to reach the masses and truly would add feathers in the cap of young musician Ratheesh Vega. His composition Sufi rock style promotional song for the movie featuring Ratheesh got released on 3rd March. Along with his band cocktail team, Ratheesh is featured in ‘Anjithal Poo’, a melodious song which is gearing up to rock Kerala. The sweet part of its rock version will be its background score with an attractive smell which can take the viewers to a dream world. The enchanting tune proves to be the soul of the movie which keeps music lovers to enjoy it again and again. 'Lucky Star' produced by Milan Jaleel which is scheduled to reach theatres on 8th March would be a visual treat for movie lovers. Meanwhile don’t miss this special rock version of Anjithal Poo Pookkum.